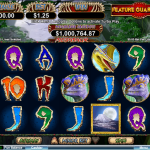 Megasaur is one of RealTime Gaming’s oldest progressive jackpot slots, and naturally there is a dinosaur theme to it. 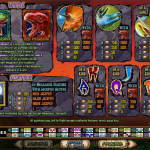 This colourful Cretaceous themed slot machine game can often see you win as much as one million credits, and it is as cheap as chips to play. 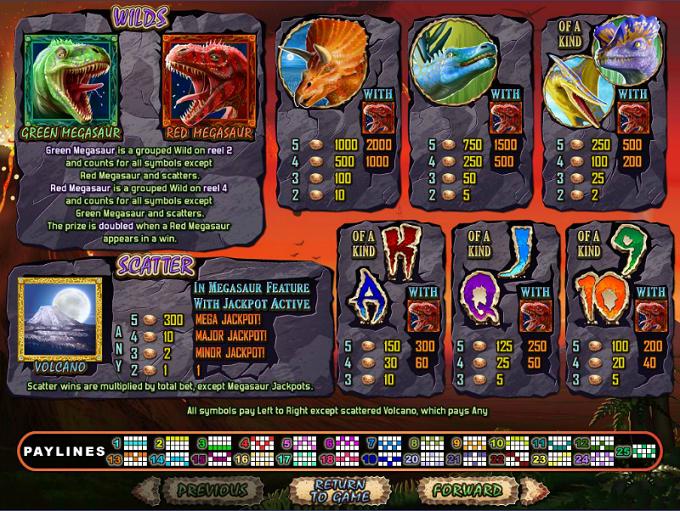 RTG’s Megasaur slot machine features a very basic 5-reel, 25-line structure, and players cannot alter the number of lines which star in this slot. Instead, players can select total bets which include a minor bet of 1.25 per spin, a major bet of 2.50 per spin, or a mega bet of 5.00 per spin. This is not a slot which is going to bust the bank. Players can expect to be able to compete to win a non-progressive prize worth 1,000 coins in all, even if they don’t get anywhere near the progressive jackpot in this slot machine game. 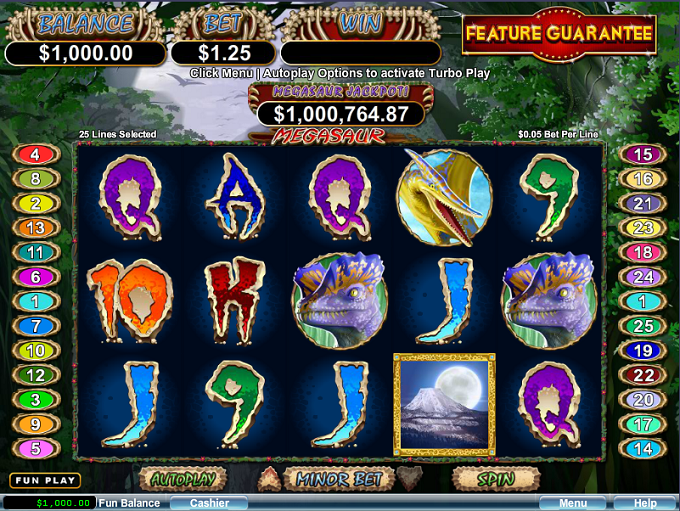 There are two wild symbols present in this slot machine game, and they are the Green Megasaur, and the Red Megasaur. The Green Megasaur appears grouped on the second reel, whilst the Red Megasaur appears grouped on the fourth reel. Wilds can substitute all other symbols save for each other, and scatter icons. Any wins which contain Red Megasaurs will have their wins doubled. Scatter icons take the shape of a volcano. 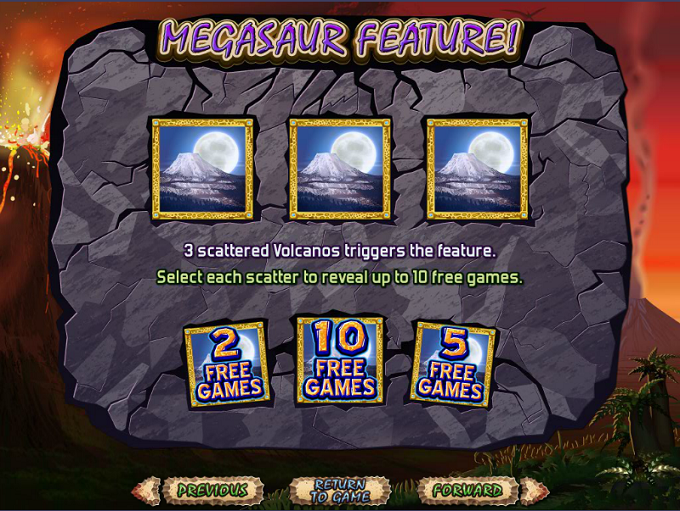 Should volcanos appear 2, 3, 4, or 5 times in any position on the reels of this slot machine game, players will pocket wins worth 1x, 2x, 10x, or 300x their total bet in scattered wins. Players need to wager the maximum stake to stand a chance of winning one of the progressive jackpots, which are paid out via the scatter icons. Players should also note that they can trigger the features within 26 to 250 of spins if they activate the Feature Guarantee mode. This feature mode does cost a bit more than a regular bet, though, so it is up to you to decide if it is worth it or not. As well as pocketing those scattered wins, players will also get to land a free spins bonus round. Players can bag anything from 2 to 10 free games in this feature. 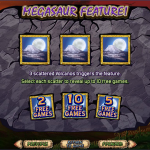 Players should note that a Megasaur feature can see Megasaurs eating other dinosaurs on the reels of this slot, to give you a chance to bolster your winnings. By using the feature guarantee mode, you stand a better chance of landing these features.